The first few missions set up the scene perfectly, with the first scene showing the moon lander, and then revealing the US outpost set up over a nearby ridge. Things are very different in this universe, when the US landed on the moon, they went back and brought the hover tanks this time. According to Battlezone, this is what is actually on the moon. The actual game is a hybrid first-person-shooter / strategy game. You play as a US forces commander stationed on the moon and in a typical mission you are provided with a variety of options to play with. The strategy aspect is fairly straightforward, but the fact that it is also tied to a first person game makes this a game very interesting. There are very few games that have explored this kind of gameplay, especially in a singleplayer setting. 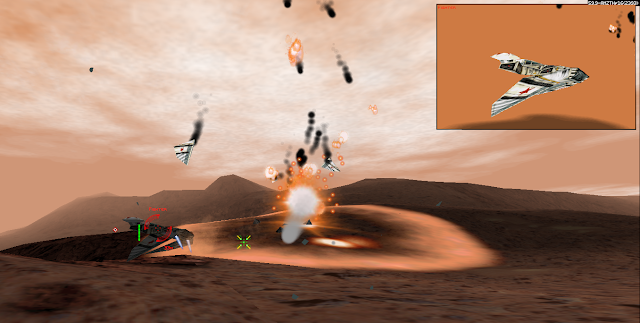 Most of the game takes place from within the cockpit of one of several types of hover tanks. The controls are a mostly standard first person shooter affair, but with the added ability to issue orders to structures and friendly units from the comfort of a tank. 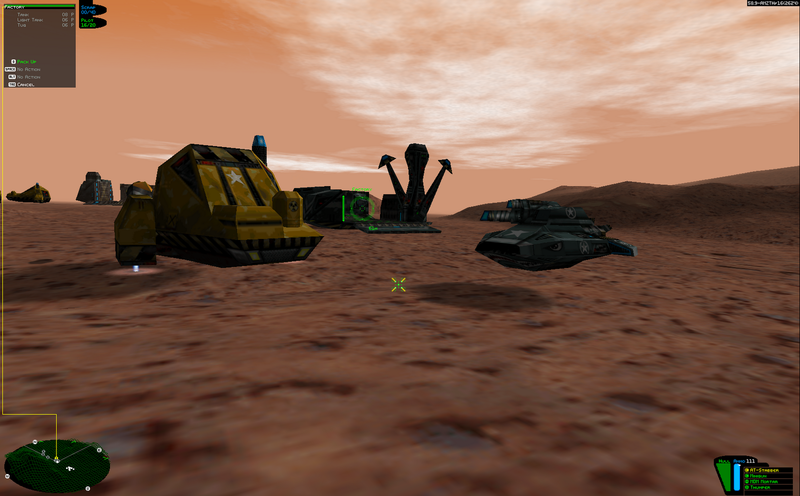 The player is also able to leave their vehicle to walk around on foot, and enter other vehicles. This often becomes necessary if the player's tank is destroyed by overwhelming enemy fire, leading to the tense situation of walking around on foot with the constant fear being turned into a pancake by Soviet forces at any time. There are many interesting mechanics such as this that make Battlezone worth investigating, another example of which include the sniper rifle. When on foot, it is actually possible to take out enemy pilots and steal their vehicles with this, but having to be on foot while doing so leaves the player very exposed. The Scavenger unit (left) is the NSDF (US) forces resource collector. The Grizzly Tank (right) is the main staple tank of the NSDF forces. The campaign takes the player through a wild ride throughout the solar system, and actually provides a wide variety of mission types. A lot of them follow the basic formula, setting up a base, collecting resources, and taking on some basic objectives. However there are many brilliant missions that explore some of the more intricate mechanics of the game. There are several stealth missions that are well done, and often strangely enough involve a basic platforming making use of the jumping capabilities of hover tanks. The variety is impressive, and there is a second, shorter, Soviet campaign as well which provides a whole new set of units and toys to play with. Throughout the game, players get a wide variety of tanks, as well as walking robots and even stationary defence and artillery pieces. All of these can be controlled by AI, or the player can jump in at any time for pretty much all of the vehicle types. They can even drive around in the defenceless resource collector if they so choose. The game provided a lot of freedom in how to approach missions, but the game also provided a lot of guidance on what mission objectives were at any given time. Battlezone did create somewhat of a legacy. Josh Resnick (Director of Production) and Andrew Goldman (Director) left Activision to form Pandemic Studios, around the time of release of Battlezone, and then worked with Activision to produce a sequel. 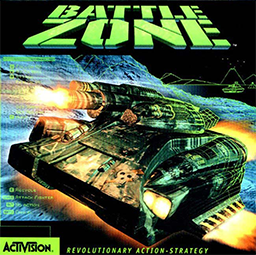 Battlezone 2 is also a great game in itself and is worth looking at, although it did not add much to the original formula. Pandemic later went on to create the Full Spectrum Warrior series, which was a much more realistic third-person tactical shooter, which featured a command system which the beginnings of which can be clearly seen in the Battlezone franchise. Sure does look like an explosion from 1998. Much more recently, a new game called Bionite Origins which aims to restart the genre originally made by Battlezone back in 1998 has recently found success on Kickstarter. It will be interesting to see if these gameplay mechanics translate to the modern day, and whether there is any interest in such a thing. 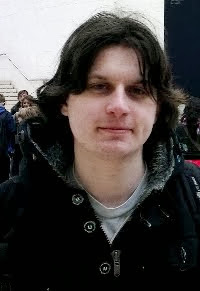 The legacy can also be seen in other games which have taken the core concept to its extreme in a multiplayer setting, with the most prominent examples being Natural Selection, Nuclear Dawn and Savage : The Battle for Newerth. These games also blur the lines between action and strategy games, and each have a very different take on it. The gaming world needs more interesting titles like this. It is amazing to think that this is a game that was both developed and published by Activision. The GiantBomb wiki has a very extensive page on Battlezone if you would like to know more. If you are interested in playing Battlezone on modern hardware, check out the 1.5 patch released in 2011 which was made by Ken Miller, the game programmer on the original game. Fond memories of this game, especially ejecting out of vehicles and floating back to the ground while sniping the attacker's pilot. I think the scale of the game seemed huge after all the closed corridors of Quake II as well as the speed - navigating the uneven terrain finding good lines I remember being critical in some missions. Great game and great memories. This doesn't mean we'll see the end of Triple-A games, but it does re-evaluate the value of such games.